Record's mixer is a cut above many others. Experiment, explore and experiment some more! Until you set aside plenty of time to get to know the mixer, front and back, you won't be getting the most out of this powerful tool. And don't forget to check out the Audio, Mix and Master units in the rack, too! For all its presence and power, the Main Mixer is just another device, albeit one with plenty of bells and whistles, and one that can only appear once in your project. So if you aren't worried about using its handy Control Room output, you can place whatever you want before or after it in the signal path, including other sub-mixers, should you feel the need. Don't forget, you can send and/or split the signal from a channel, then route it back into another channel or device, should you so desire. This can be useful for such things as sidechaining, parallel processing (layering the dry signal alongside a compressed one, New York style, for example) or maybe even driving a vocoder. 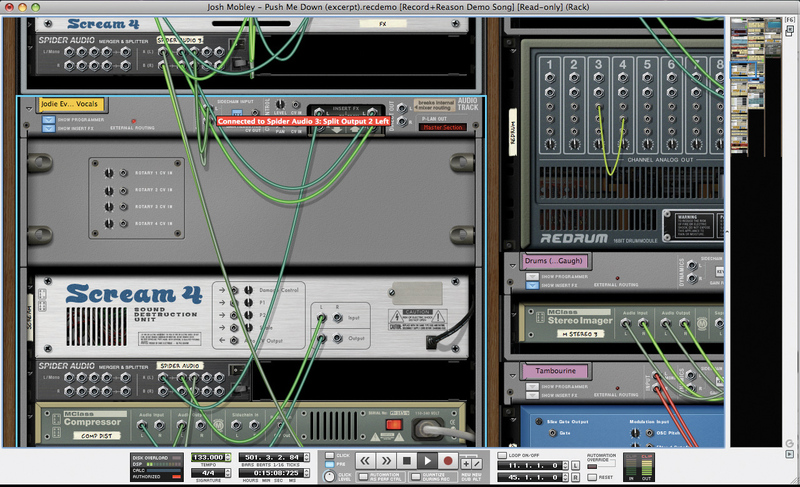 Reason and Record share a crucial selling point - their ability to have so many signal types routed to so many places. A great example of this is the CV output from the sidechain section, enabling the sidechained compressor's actions to control other devices that accept CV input. This could be anything from the volume on another device or channel, to a filter's cutoff frequency. You can achieve the classic de-essing effect by sending the signal of a sibilant vocal into the sidechain input on its own channel, engaging the Filter to Dynamics button and using the filters to accentuate the top end and cut the bottom, so only the sibilance triggers the compressor. You can even try placing another EQ into the signal path to really isolate the frequencies to be quietened. 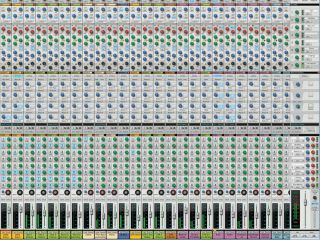 One of the most under-appreciated features in any DAW is the ability to save channel strips - or, in the case of Record's Main Mixer, insert effects configurations. You wouldn't expect to have to add a fader, level meter and gain pot to every channel by hand when you start a new project, so why not extend the concept to include some standard starting FX chains, ready at the push of a button. 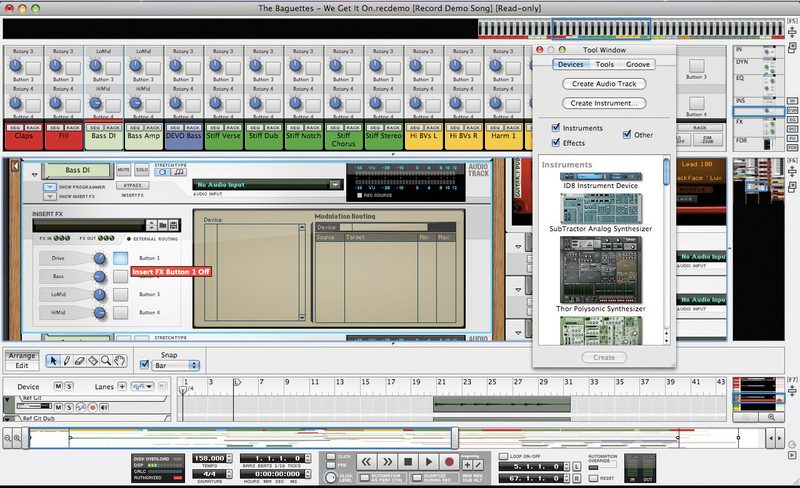 Just as Reason and Record's famous Combinator offers assignable front panel controls, so too do the mixer channel strips (assigned in the corresponding rack units). These are just the ticket for making regularly tweaked parameters readily available, particularly when using custom insert effect channel strip presets. When combining drums, vocals or other layered sounds, it always helps to create a sub-mix, and this is very easy to do with the Main Mixer. Simply route the Direct Outs to a 6:2 or 14:2 mixer (or even a Spider Merger), then send the output of the sub-mixer back into a new Mix track in the Main Mixer. You can now set relative values and process all the parts combined. Have a go at reverse engineering the Record demo songs and take a look at how these professionally produced tracks have been mixed, and the kinds of routings and combinations of effects that have been used. You can use the same sub-mix principle when recording - to mix down the inputs from separate microphones, for example. Much of the reason for doing this in the past was limited resources, though, and while there is still value in printing a good multichannel take to one track (it can push things along nicely), these days we tend to capture parts separately, enabling later processing. There are plenty of reasons why you might want to send a signal to an external output rather than the mixer - whether it's when recording, using external FX, ReWiring, mixing externally or using a summing bus - and this is when the Main Mixer channel strip Direct Outs come in very handy. Simply route one to the desired output. One of the few things people really miss about using a hardware mixer is the ability to adjust more than one level at a time. If you've never had the pleasure, and have a control surface with multiple faders, use Record's extensive hardware mapping functions to assign them to channels in Record's Main Mixer. The Pre-fader FX send feature can be great for special effects. Try lowering the fader on a channel (or channels) and listening as the sound of a reverb stays loud while the signal fades. Done well, the sound source will appear to be moving into the distance.